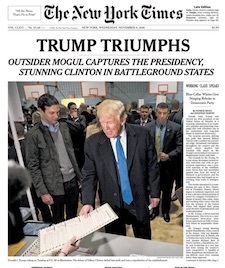 Is Trump Driving a Print News Comeback? We’re not even a year in, and already the Age of Trump has changed everything from the tax code to America’s standing on the world stage to regulations protecting the environment and the Internet. Even the office and role of the President himself has been redefined. But there’s another institution Trump appears to be transforming before our eyes, even if he doesn’t realize it: the press. Profit soars at NY Times Co.
We talked about our nutty leader nonstop for the duration of last year. While Trump has been the most unpopular first-year President in modern history — his polling has consistently hovered between 30 and 35 percent — it’s equally clear that he’s enlivened the headlines. It’s no secret that Trump has continued to make gold for the cable news networks, and the most recent ratings figures prove it. Fox News, which has remained the most-watched cable news network for 191 consecutive months now, wrapped up 2017 as its most watched year ever in terms of total day views. MSNBC climbed 47 percent in year-to-year total viewer gains, growing more than any basic cable network and topping CNN in this category for the first time since 2012. CNN also saw its highest rated year on record in terms of total day views. It appears the Trump era has driven an increased interest in all matters political from the public. This is a great thing, and while it’s no surprise that it’s precisely why 2017 has been such a banner year for the news networks, what’s more impressive is that, by all indication, the Trump effect also seems to have resurrected the public’s interest in print media, or at least stalled its years-long demise for the time being. The New York Times Co. in November reported third-quarter revenue growth of 6.1 percent to $385.6 million, as well as $33 million in operating profit compared to $8.9 million a year ago, growth the newspaper of record attributed to a 13.6 percent gain in subscription sales, much of which was accounted for by digital subscription revenues. The New York Times counted 2.5 million paid digital-only subscribers by the end of the third quarter, a net increase of 154,000 from Q2 alone and a 60 percent hike from a year ago. Digital advertising, which now accounts for more than 43 percent of the Times’ total ad revenues, gained 11 percent to $49.2 million. The Washington Post, meanwhile, recorded 89 million unique readers in October, continuing to surge skyward from its previous record of 81 million readers in May. Page views also exceeded a billion for the first time, accounting for year-over-year gains of 33 percent. Finally, News Corp. flagship the Wall Street Journal, which is currently gearing up to undergo a digital reorganization, blew past all performance and earnings expectations in November, with total subscribers across its print and digital editions up more than 13 percent year-over-year to 2.2 million. The Journal’s digital subscribers alone increased to more than 1.3 million during the same period, compared to 967,000 in 2016. These are big numbers, and they’re just a few of 2017’s print success stories. But why the sudden uptick among these dinosaurs, as opposed to the countless blogs and online opinion sites that have dominated the media landscape for the last decade? As it turns out, the fourth estate wields a particular influence others don’t. New research by San Francisco-based tech PR firm Bospar found that a news article from a trusted outlet is likely to change a closely held conviction — a position for or against climate change, for example — among a third of the U.S. population, thereby making that medium more effective at changing Americans’ minds than any other, even peer-reviewed research. Why is that? A recent consumer survey commissioned by non-profit Two Sides found that trust in digital media has collapsed in light of a scourge of fake “news” reports and hoax items shared over the Internet in recent years, and as a result, Americans find print media to be a safer, more secure and trusted medium than its digital counterpart in virtually every way. Poynter Institute’s 2017 Media Trust Survey found that overall trust and confidence in the media has actually increased since President Trump took office, to the highest levels since 2001. Trust in the press was markedly lower among those who identify as Republican, however, with 44 percent claiming they believe the media fabricates stories about Trump on a regular basis. Alarmingly, 25 percent of those polled also support limitations on press freedoms. I guess there’s always room for improvement. As it turns out, Trump could be redefining the current U.S. media landscape in other ways as well. Perhaps in light of the fake news furor that gripped the Presidential election last year, recent data from research firm Verto Analytics showed that U.S. Facebook users spent less time on that social platform in 2017 than they did the year prior. That’s not necessarily a bad thing either.